Demerara Harbour Bridge, Guyana, 1815 meters, 1978. 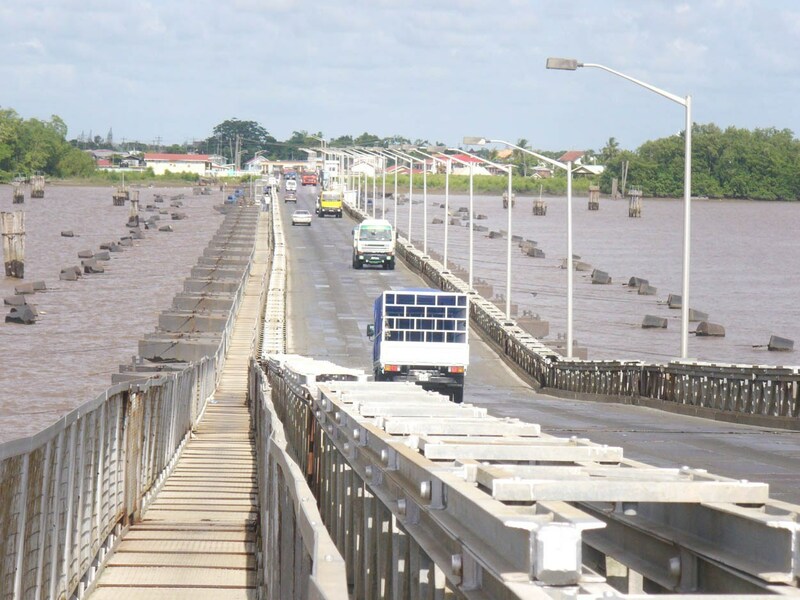 The bridge spans the mouth of the Demerara River at Guyana’s capital, Georgetown. Thos. Storey(Engineers) Ltd., a British firm known for manufacturing Bailey Bridges, designed and also fabricated the bridge components. Guyana’s Ministry of Works and Transport designed the abutments, toll plaza and western approach road. The two- lane bridge currently carries an average of 14,000 vehicles per day. The bridge’s capacity is limited by having to open daily to allow river traffic to pass, and the retraction process is slow. Also, bridge opening times depend on water levels and flow velocities (tide), which often conflict with peak traffic times. The Demerara Harbour Bridge Corp., the bridge’s owner- operator, hired LievenseCSO, a Dutch hydraulic and coastal engineering firm, to conduct a feasibility study and design for a new Demerara River Crossing. Their report, issued in August, 2017, states that the exisitng bridge “has long passed its technical lifetime” and “is no longer able to service the present and future traffic demand.” It recommended the construction of a new three – lane bridge with fixed footings. Nordhordland Bridge, Norway, 1,246 meters (pontoon section), 1994. This combined cable- stayed and pontoon bridge near the city of Bergen connects the mainland and the island of flat, spanning Salhusfjorden, which is 500m deep. It carries two lanes for cars and a pedestrian / bicycle path. The floating section is a steel box girder on top of 10 concrete pontoons, each with nine watertight cells. It was designed by Aas- Jakobsen. Given the fjord’s extreme depth, lateral anchorage systems would have been too expensive. Instead, the pontoons are fastened with flexible plate connections liked by bolts and cables under tension. It was built by a consortium, Arbeidsfellesskapet Salhus Bru, made up of Norwegian Contractors, Aker Enterprenor, Veidekke and Kvaerner Eureka. Bergsoysund Bridge, Norway, 933 meters, 1992. 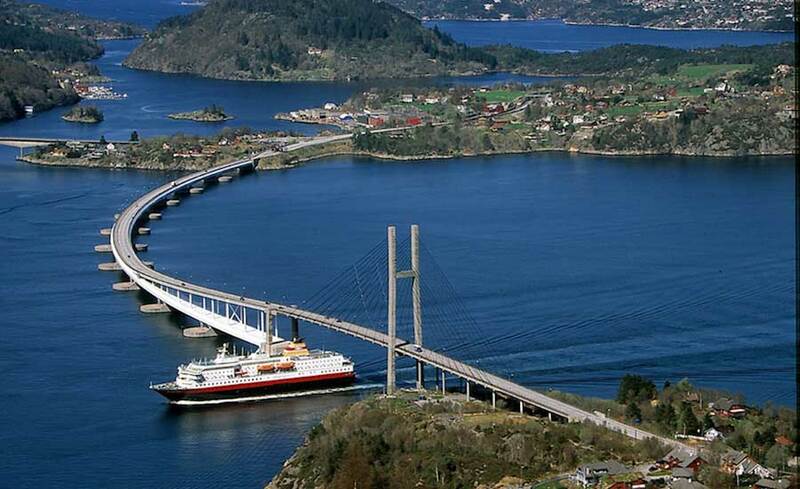 The bridge connects the islands of Aspoya and Bergsoya, spanning a fjord with a water depth of 320 meters. The engineering firm Johns. Holt designed the pontoons and abutments, and DNV Veritec designed the steel superstructure. 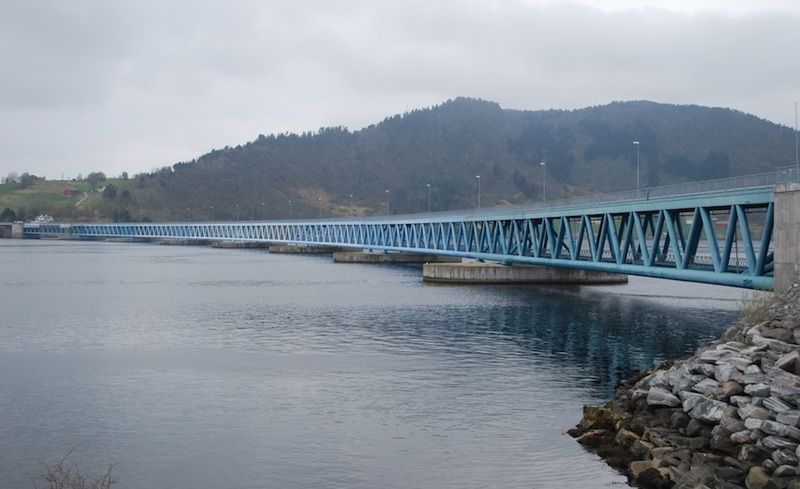 Norwegian Contractors built the concrete pontoons, and Akeer Verdal built the steel pipe truss superstructure . It rests on seven concrete pontoon foundations. Yumemeai Bridge, Osaka, Japan, 410 meters. 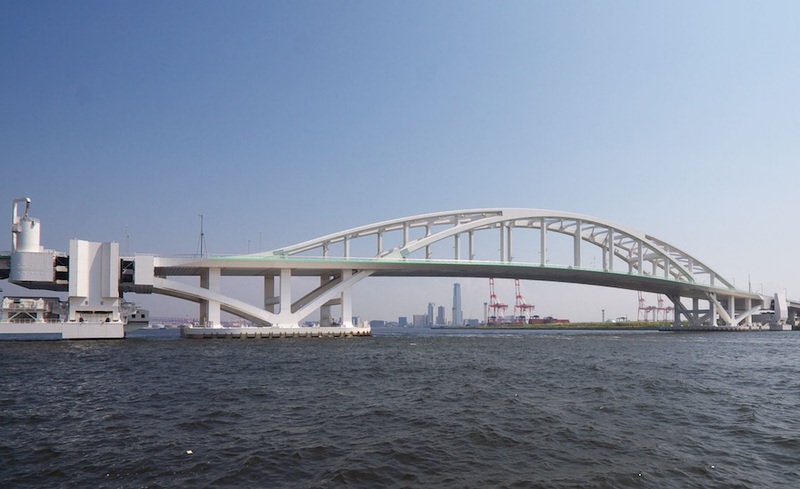 The world’s first floating swing bridge, it connects two artificial islands, Yumeshima and Maishima, in Osaka Bay. A floating bridge design was chosen because the soft ground of the reclaimed land was more suited to this approach. The bridge’s double arches rest on two large steel pontoons. The pontoons were designed to resist corrosion by lining their sides with titanium plates as well as a cathodic protection system. The floating portion of the bridge weighs 30,000 tons. 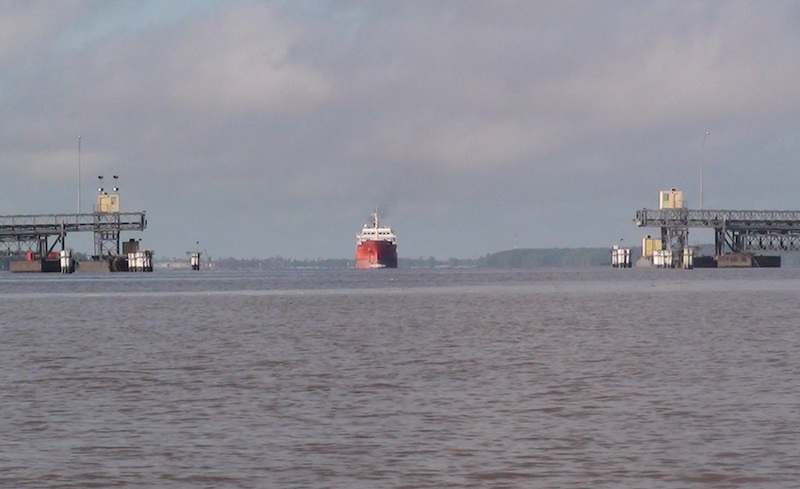 The North Waterway which it crosses is rarely used by boats, but when it is, the bridge is maneuvered by tugboats. 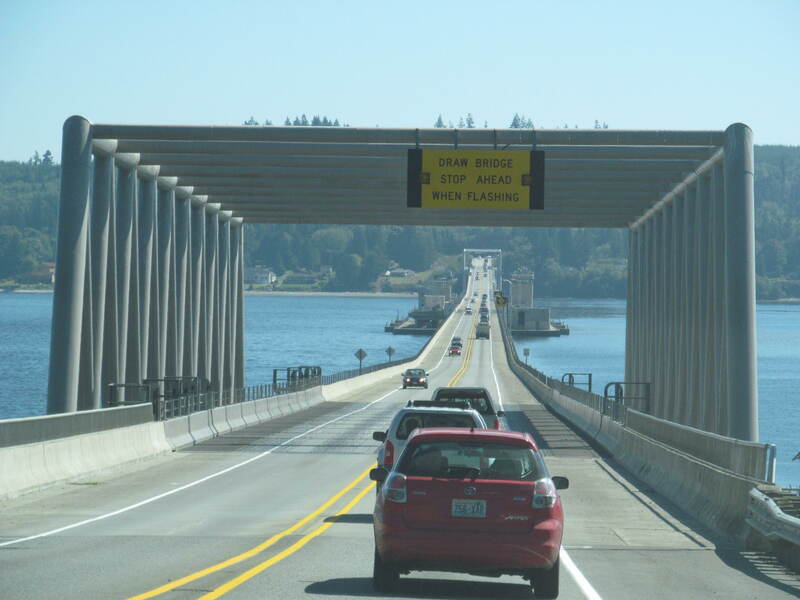 Evergreen Point Floating Bridge, floating portion is 2,350 meters. It was completed in 2016. 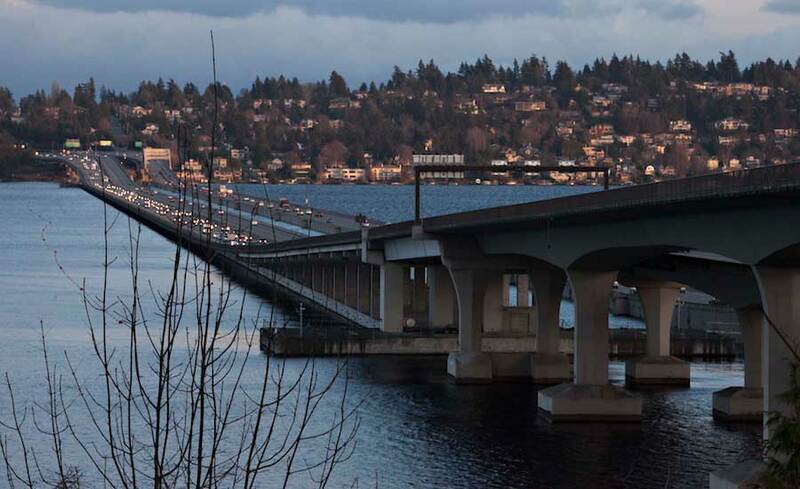 The six- lane bridge carries State Route 520 across Lake Washington from Seattle to its eastern suburbs. It features 77 concrete pontoons secured to the lake bottom by 58 anchors tethered to steel cables. Twenty- one of the pontoons that support the deck and superstructure are each 110 m x 23 m x 8.5 m and weigh 10,000 tonnes. 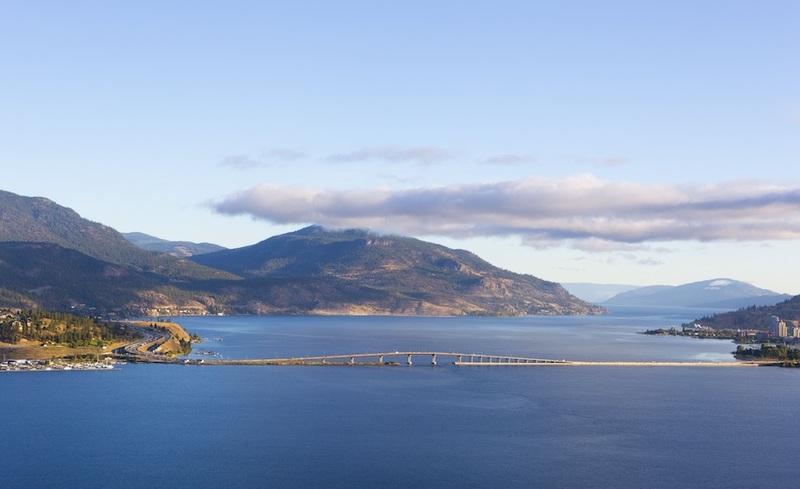 Fifty- four supplemental pontoons used to stabilize the weight of the bridge weigh 2,300 tonnes each. Two cross pontoons weighing 9,200 tonnes each at each end connect the deck to the fixed bridge approaches using hinges. 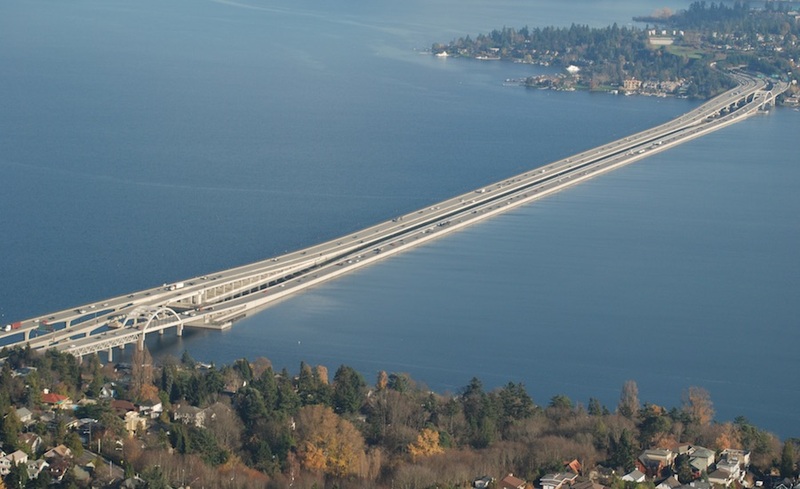 The Pontoons were designed by WSDOT and the superstructure by KPFF. The bridge was built by a joint venture made up of Kiewit Corp., General Construction Co. and Manson Construction. The lake’s topography- a water depth of 61 m of soft silt- favored the choice of a floating bridge, as a conventional bridge would be prohibitively expensive and require costly towers and huge approaches that would be out of character with the largely residential area. The construction cost was $4.5 billion. 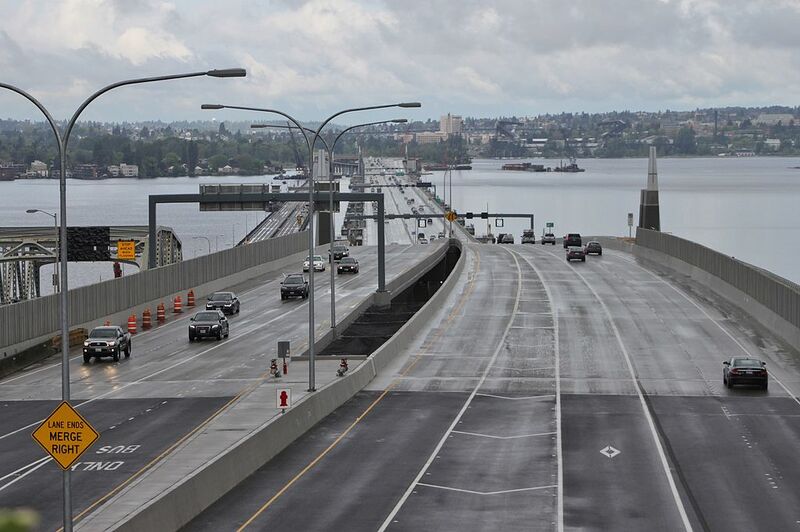 It replaced the previous Evergreen Point Floating Bridge, A four- lane span that opened in 1963.